An overview of the configurable settings in the LAW PreDiscovery Electronic Discovery Loader, that are specific to the type of source you’re importing. Based on policies and project specifications, the settings tab is used to determine how specific file types will be handled during the import process, such as extracting the contents of an archive or detecting duplicate files, as well as how the files will be organized in the folder view of LAW PreDiscovery. + Avoiding the Redaction "Epic Fail"
Doug Austin is the Vice President of Products and Services for CloudNine. Doug has over 30 years of experience providing legal technology consulting, technical project management and software development services to numerous commercial and government clients. Doug is also the editor of the CloudNine sponsored eDiscovery Daily blog, which is a trusted resource for eDiscovery news and analysis, and has received a JD Supra Readers Choice Award as the Top eDiscovery Author each year since 2017. Tom O’Connor is a nationally known consultant, speaker, and writer in the field of computerized litigation support systems. Tom’s consulting experience is primarily in complex litigation matters. + Will Information Governance Bail Us Out of This Mess? + Is Blockchain Really as Secure as People Think? Doug Austin is the Vice President of Products and Services for CloudNine. Doug has over 30 years of experience providing legal technology consulting, technical project management and software development services to numerous commercial and government clients. Doug is also the editor of the CloudNine sponsored eDiscovery Daily blog, which is a trusted resource for eDiscovery news and analysis, and has received a JD Supra Readers Choice Award as the Top eDiscovery Author for 2017 and 2018. Doug Austin is the VP of Products and Professional Services for CloudNine where he manages professional services consulting projects for CloudNine clients. Doug has over 25 years of experience providing legal technology consulting, technical project management and software development services to numerous commercial and government clients. Mike Quartararo is the founder and managing director of eDPM Advisory Services. He is also the author of the 2016 book Project Management in Electronic Discovery, the only book to merge project management principles and best practices in electronic discovery. A snapshot demonstration of the process required to update an image base within Concordance Desktop. Some of the various ways in which to update a Concordance Desktop image base are renaming media paths and folders, editing or deleting media keys and calculating and updating the page count for an image base. Use Concordance Desktop’s Image Base Management feature to accomplish each of these tasks. A snapshot demonstration of an introduction to the LAW PreDiscovery Electronic Discovery Loader. + Who Uses Information Governance? Doug is the VP of Products and Professional Services for CloudNine. At CloudNine, Doug manages professional services consulting projects for CloudNine clients. Doug has over 25 years of experience providing legal technology consulting, technical project management and software development services to numerous commercial and government clients. + Is there a template for how parties should cooperate in a Technology Assisted document review? + Should a plaintiff be allowed to email all defendant employees to see if they have responsive documents? + Will fabrication of text messages result in sanctions post Rule 37(e)? + Can Twitter be compelled to produce direct messages between their own employees? + Can an individual be compelled to produce private Facebook photos by the opposing party? + How have proportionality considerations in the 2015 Federal rules affected scope of discovery? + Should a receiving party be granted a quick peek at privileged documents to resolve privilege disputes? + Should border searches of electronic devices require a warrant? + Can you be sanctioned for discovery violations even after a jury verdict? This webcast provides an overview of CloudNine, the vision for our new robust suite of products and how they will extend and enhance your data and legal discovery efforts. CloudNine recently acquired the Concordance, LAW PreDiscovery and Early Data Analyzer platforms. So, who is CloudNine, why did they acquire these products and what is their vision for them going forward? This presentation and technology demonstration led by CloudNine Vice President and eDiscovery Daily Blog author Doug Austin will provide attendees an overview of CloudNine and its capabilities and how the newly acquired products fit into the vision for the future of eDiscovery technology at CloudNine. A snapshot demonstration of the process required to select user views within CloudNine to select a view that best fits with your workflow of reviewing documents. Workflows associated with reviewing documents in discovery can be varied, depending on the task to be accomplished during a review, the type of information needed to conduct the review effectively and the individual’s preferred style in conducting the review. CloudNine provides the ability for users to select from three different views of the data: 1) a vertical doc list view that enables you to see the document and metadata within a single screen navigated within a sequential list of documents, 2) a native tree view list that enables a drill down based on the organization of the data loaded and 3) a table view that enables you to view the metadata for multiple records on one form and the document on another form. These three options give reviewers a choice in selecting a view that best fits their workflow. Brian is the Director of Customer Success for CloudNine. 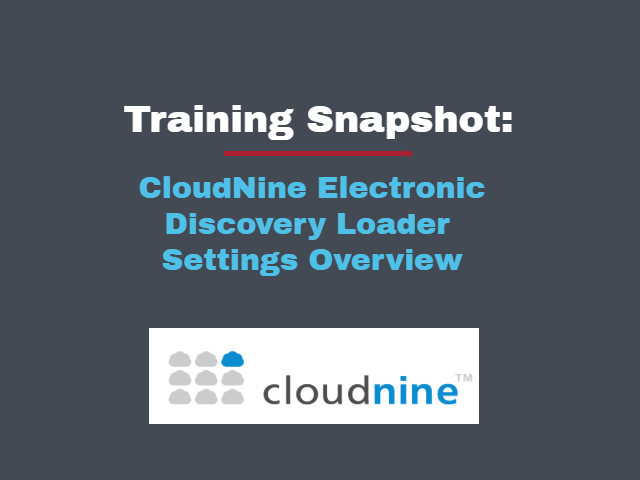 At CloudNine, Brian manages training, support and customer success efforts for CloudNine's Software-as-a-Service (SaaS) eDiscovery clients. Brian has extensive experience providing legal technology consulting and technical support services to numerous commercial and government clients ranging from multinationals corporations and large law firms to litigation support providers and governmental agencies. A snapshot demonstration of the process required to create new user metadata fields within CloudNine to track and classify documents and the review and production process. Classifying documents as responsive, non-responsive or privileged and recording and tracking information about the documents during the review and production process is key to effective management of the discovery process as a whole. CloudNine provides the ability for users to create their own metadata fields and share those created fields with other users (if desired) to track and classify documents and manage them throughout the review and production process. Regular webcasts for data and legal discovery professionals. Up-to-date and informative webcasts on all things data and legal discovery from the leading provider of discovery automation technology, CloudNine. Regular content includes briefings, presentations, and legal education events designed to intrigue, inform, and improve viewers understanding and execution of audits, investigations, and electronic discovery tasks. Learn more at eDiscovery.co.